The last line of this book was SO much better than the last line of Gilmore Girls :) I won't give it away, but it's good. A cliffhanger without really being a cliffhanger, leaving you desperate for the next book. Set just 5 minutes after the end of Illuminae, Kaufman and Kristoff introduce us to two new leads - Hanna, daughter of a military leader on the Heimdall, and Nik, a juvenile delinquent who is a member of a mob family. BeiTech is still attempting to cover it's tracks about the Krenenza invasion, but if you thought that was cutthroat, you haven't seen anything yet. The Hypatia is on it's way to the space station, and that's the last rendezvous that BeiTech can allow. I love this series. Seriously. I love it. Not only is it genially executed, but it's also fast-paced, detailed, and smart. 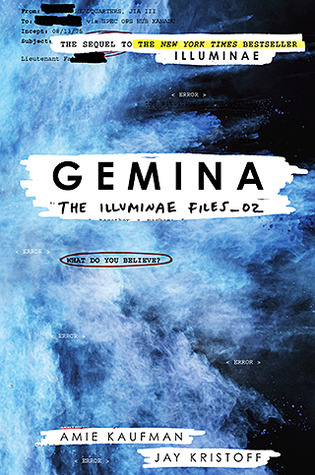 The end of Gemina gets a little confusing with multiple timelines and dimensions, but that made it all the more awesome. The authors transition between characters flawlessly, matching tone and mood that is never disrupted. I don't want to give too much away, but the imagery, layout, and artificial intelligence that made Illuminae great can also be found in Gemina, along with a better, more horrifying picture of a truly despicable villain. If you get the chance, listen to the audiobook with a copy of the book in hand. You won't be disappointed! I'm glad to see the second book was as good as the first which I still have to read. I'm hoping to squeeze it into my ever growing 2017 reading list.